The moment comes to everyone's life who do a job when you have to write a resignation letter. There could be any reason behind you want to leave the job. It could be that you may have found a better job or you may want to start your own business. Whatever the reason is informing your employer in writing about your resignation is very important. When you've decided that you want to leave your job, it is highly advisable that you talk to your reporting manager & the HR manager of your company about it before you send them a resignation letter. You should always give your resignation letter in person but in some cases when it is not possible, you can send it over email. A sample resignation letter template always comes handy when you need to write yours. 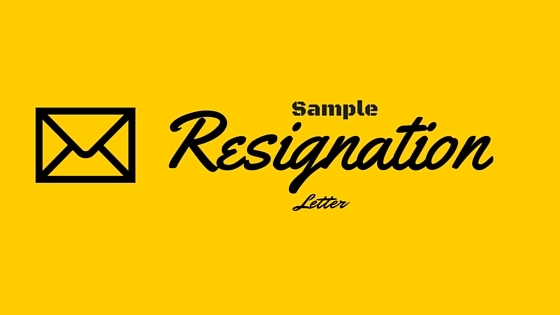 In this article we're going to write a sample resignation letter that you can use while you write yours. Please except this letter as a formal notice that I am resiging from my position as [Your Designation] with [Your company name]. My last working day in the office will be [day & date]. I have got an exciting opportunity with a fortune 500 company as an [position title]. I personally believe that the opportunity will take my career to the next level. It was a great experience working with you and your team. I learned many new things over the 3.5 years of association with you. I wish you and the company a great success in near future. During my notice period, I am ready to wrap up my duties and recruit and train my replacement. I will make certain that all reporting and records are updated before my last day of work. Thank you once again the opportunity. I wish you and the staff all the best and I look forward to staying in touch with you. You can write to me anytime at [Your Email Address] or can call me at [your mobile number]. We personally feel that this sample resignation letter template will surely help you write one for you. If you liked our effort, show your love sharing this article on Facebook, Twitter, LinkedIN etc. Now you need not to ask any one "how to write a resignation letter". We wish you best of luck with your new job.